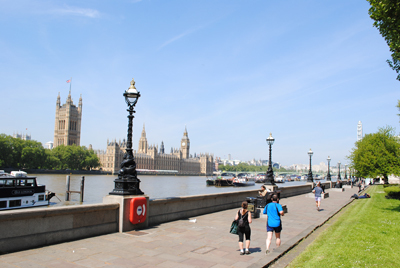 This Thames-side stretch of land, part of the massive Thames Embankment, was completed in 1870 after several years work and named for the then-reigning monarch, Queen Victoria. 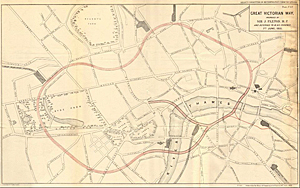 The Victoria Embankment, which runs from Westminster Bridge to Blackfriars Bridge, pushed back the waters of the Thames and reclaimed land which was used for a roadway (built over over the District Tube line) and several public gardens, collectively known as Victoria Embankment Gardens. To see the level of the original river bank, go to the lower entrance of Somerset House on Victoria Embankment and look through the glass floor just outside the doors. 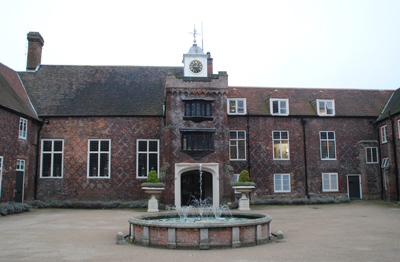 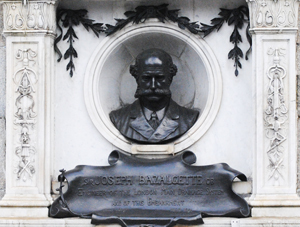 The project was carried out under the direction of engineer of the age, Sir Joseph Bazelgette, as part of his monumental effort to build a modern sewage system for London and to help relieve traffic congestion. 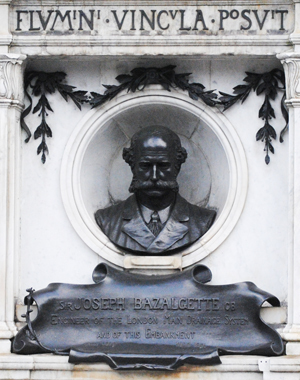 The stretch of roadway and the series of gardens which now occupy part of Victoria Embankment feature numerous statues (including one of Bazelgette himself – pictured) and other landmarks such as the York Watergate (see our previous post), Cleopatra’s Needle (see our previous post) and the RAF Memorial.